There are two “cameos” of the weight world that I treasure. One is a picture of Jack LaLanne, and the other a chapter in Alan Calvert’s book, “Super Strength”. The picture of LaLanne was in a weightlifting magazine. It was a full length picture with the back of Jack half-turned to the camera, exhibiting a magnificent spread . . . a sweep of latissimus muscle that was, in those days, something to wonder over. The caption beneath the picture, so far as I can remember, said something to the effect that Jack built his back by using the two arm pullover. It was a terrific shot and for at least two years, served as my training inspiration. It is true that the pullover DOES build up latissimus dorsi muscles and a large rib box, but these statements are general ones, for they do not mention the specific ways in which these sections of the physique ARE developed by the use of the lift, and what VERSION of the pullover MUST be used in order to get this development. As a matter of fact, the pullover is NOT the best exercise there is for latissimus development – I refer here to the straight arm version – and it IS quite an exercise for the triceps and parts of the interior and laterior deltoids. And in building a LARGE rib box, the most beneficial portion of the pullover is where it is LOWERED SLOWLY from above the chest to the floor – that is the section of the lift where it is controlled down from above the chest to the deck. And Calvert with all the wonderful wisdom that was his, took care to point this out in his book. To prove my first point, just take a light weight – very light – and grind out a couple of hundred repetitions . . . See where you are stiff the next morning . . . NOT in the lats, but in the deltoids and triceps. The reason is that the latissimus muscles can handle more weight in the pullover position than the deltoids and triceps can; and it is also the reason why so many bodybuilders injure the deltoid in the practice of the pullover with STRAIGHT ARMS. To prove my second remark, I have only to point to the vast number of superb specimens we now have and the immense popularity of the pullover in all its many styles. Calvert advised everyone to use the straight arm version, but now it is generally accepted that the BENT ARM pullover is best for rib box stretching and latissimus building. A greater weight can be handled by the “broad of the back” muscles with a correspondingly lower risk of injury to the deltoids. There is a greater stretch on the rib muscles too and a much larger lung capacity can be built up. However, in this article we are not so much concerned with the bodybuilding aspects as we are with the actual lift, the rules that govern it, and the assistance exercises that can be used to build up limit poundages. 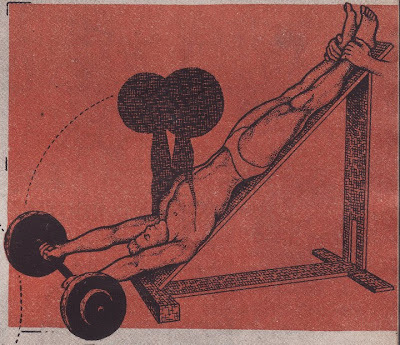 At the same time I would like to point out that these “assistance exercises” as that grand oldtimer Bull Pullum calls them, CAN be used as bodybuilding movements and will prove to be wonderful additions or substitutes to the routine you are following, and those certain exercises that might be included in it. Of recent years, there has been so much talk in this country of “BODYWEIGHT” pullovers that I am CERTAIN some of the rules governing the lift were not adhered to, and in fact, I also doubt very much if they were even known. One weight trainer claimed the colossal poundage of 205 at a bodyweight of 186, while another man says he has performed a STRAIGHT arm pullover of 192½ at a bodyweight of 170. These lifts I shall have to see. Since there is no OFFICIAL recognition of the Pull Over at Arm’s Length in this country, we will have to consider the records of a country that DOES recognize it. The present British Heavyweight Record for this pullover, according to the 1948 edition of the British Associations handbook, is 158¾ pounds. I do not know the bodyweight of the holder except for the fact that he IS a heavyweight. The most weight I have ever seen lifted in this manner was by my foster brother, Bert Assirati, who made a poundage in strict style of 200 while weighing in the region of 260 pounds. He also did 15 repetitions with what was the BRITISH RECORD at that time – 140 pounds . . . 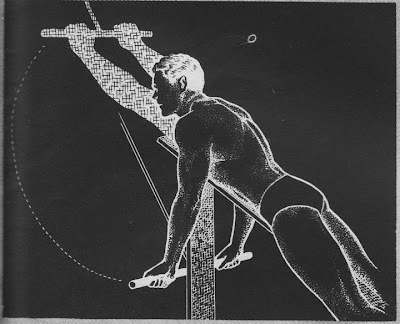 The famous Alan P. Mead, human anatomical chart, at one time held the pull over record, making 140 pounds (correct me if I’m wrong), and he also performed SEVENTY repetitions with SEVENTY POUNDS, STRAIGHT ARM. This feat was witnessed by Joe Assirati, “Ras” Back, and myself. It is an interesting fact that Mead was noted for his exceptional triceps and deltoid development. The exercises given as assistance movements will help to strengthen all the muscles involved in the performance of the Pullover at Arm’s Length . . . the triceps will be strengthened. The deltoids and latissimus will also gain more power . . . No weight trainer can hope to succeed in building up POWER if he neglects to strengthen each and every individual muscle. It is no use you trying to use heavy weights in the deep knee bend if you have a weak back. You cannot hope to improve your dead lift if your grip is weak. You will not be able to make a credible pullover if your deltoids are not proportionately as powerful as your lats or triceps. First let us see what the rules are for the pullover and then we will get onto the Assistance exercises. Lying on the ground with the arms extended behind the head, the barbell shall be raised until it is immediately over the lifter’s face. Throughout the lift the buttocks shall remain on the ground, and the arms and legs be kept straight. In the performance of this lift the use of a dumbell is not permitted. 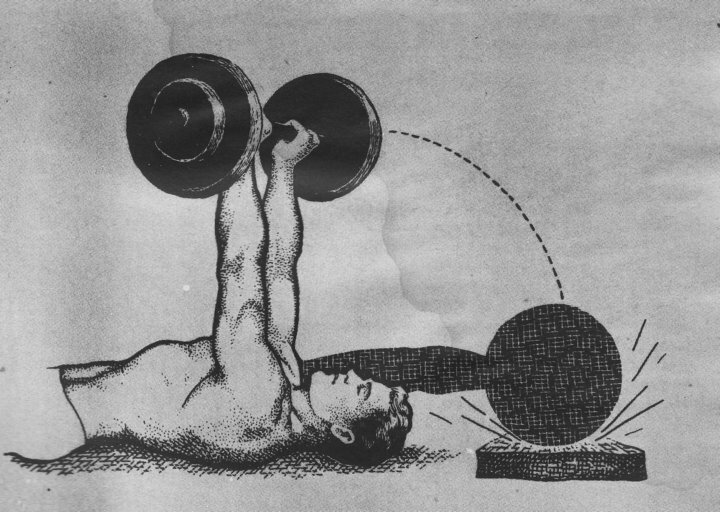 In this lift the maximum width of hand separation shall be approximate shoulders width. 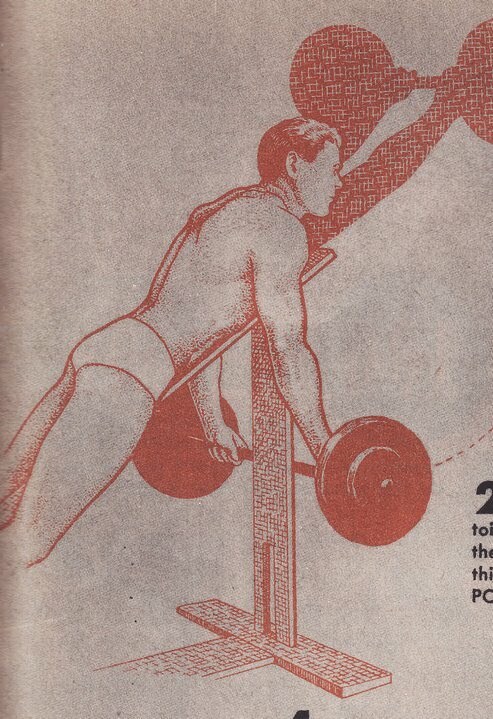 Although a count is not insisted upon at the commencement of this lift, a pause must be observed and the lift must not be continued from the momentum gained by lifting the bar into commencing position. You will note that bridging is not allowed and the arms have to be kept straight. You will find that turning the wrists UP as the weight is pulled over will help decrease the leverage on the shoulders a trifle. As with every other feat of strength, the only way to improve is to practice it. When trying limit poundages on the pullover, it is wisest to thoroughly warm up first. Take a weight, light and easy to handle and perform a number of fairly rapid repetitions with it. Then gradually increase the weight making a single repetition at a time. As you approach your record – personal record – watch for signs of strain in the deltoids or elbows. At the first sign of discomfort, drop the weight down and gradually decrease to your commencing poundage. Here is a combination exercise that will increase the power of the deltoids and latissimus in step with each other. Take an exercise bench and a dumbell. Lie on your side on the bench with the dumbell held in the hand – the arm is at full stretch along the side. From this position raise the weight up and over until the arm is pointing straight above the head. From this position return the weight to commencing position, stopping just an inch above the thigh for a short count of two and returning again to the “arm above head” part of the lift. You will see the arm describes a half circle. Stretch can be placed on the latissimus muscle by carrying the arm back of the head but this is only advises when the movement has been used regularly for at least a month. Start off with a weight you can handle for 3 sets of 8 repetitions and work up GRADUALLY to 3 sets of 15 before increasing the weight. Don’t forget to equally exercise both arms. In the straight arm pullover you must have powerful deltoids. Any weakness in this muscle and you’ll never reach really high poundages in the lift. The advantage to the following lift is that resistance is on the muscle every inch of the way, as contrasted to Standing Raises with a barbell. In this latter exercise, resistance lessens as soon as the arms have moved though the upper section of the lift. Lie face down on an incline bench. Hold a barbell in the hands. The bar will be stopped by the backboard support of the bench. From this position raise the weight until the arms and body are in one straight line. DON’T heave the weight and DON’T allow the body to assist in any way. When the arms are raised to their fullest extent hold the position for a count of three, then lower the weight as SLOWLY as you can. Repeat the lift. Don’t try and use a heavy poundage in this exercise, but be content to start off with a light weight – one that you can use easily for 3 sets of 8 reps. Slowly work your way up to 3 sets of 15, increasing the exercise poundage then. One of the main principles in Olympic training – and may I stress that this is my own personal opinion – is to get the lifter used to handling heavy poundages by teaching him to handle them QUICKLY. This principle has been applied in many ways and is known by a score of names, chiefly among which are “Cheating exercises” and “Rebounding principle”. I also used the term “Power Exercises”. Here is a method of applying this principle to the pullover – it ISN’T a new movement. It is simply the good old “bouncing” pullover. 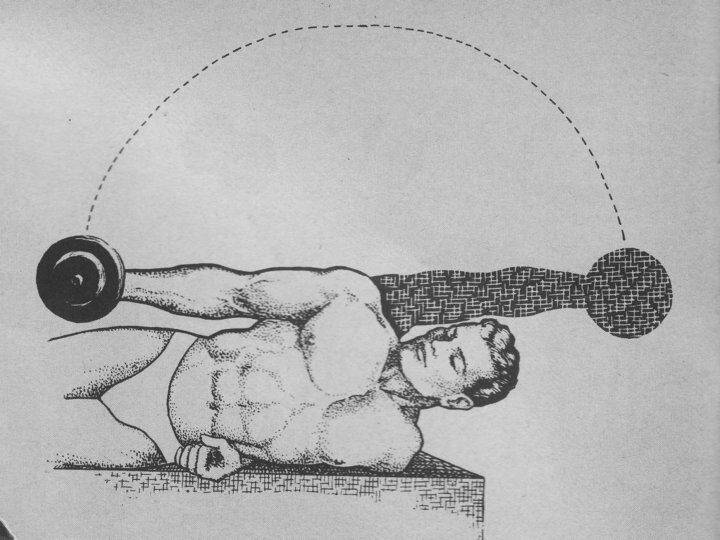 Hold a barbell above you as you lie on the floor. The elbows should be SLIGHTLY bent but kept LOCKED in that position. From here, drop the weight back of you to the floor and HIT it hard. The weight will of course “bounce”. Catch it on the rebound and raise it to commencing position and repeat the movement. It is best to do this exercise on a good thick mat. Start off with a weight you can handle EASILY for 2 sets of 10 reps, and work up to 2 sets of 20 before increasing the weight. Here is another exercise to increase the “pull down” power of the lats. Place an incline board with the angle sloping away from a lat machine. Lie down on the board, face down. Reach up and grasp the lat machine bar and pull down. Touch the support of the incline bench and then return the arms SLOWLY to commencing position. Start off with a weight you can handle easily for 3 sets of 10 reps and work up to 3 sets of 20 before increasing the weight. Don’t allow the body to assist during the exercise. Make all movement from the arms only. Another good lat strengthening movement is the upside down pullover. Once you get used to performing this exercise a fairly heavy poundage can be handled. Lie on an incline board with your head at the base and your feet at the head. The barbell should be at arms length back of you. From this position pull it up until it is directly over the face. Lower and repeat. DON’T lower it with straight arms, but allow the elbows to unlock and lower the weight with the arms BENT as much as possible. Straighten the arms out again and repeat the movement. Start off with a poundage you can use for 2 sets of 7 comfortable reps and work up to 2 sets of 12 before increasing the weight. Alternate raises with dumbells while standing are great for building power in the anterior deltoids and, used in the following manner, even better for developing the deep lying fibers and thus helping to prevent strain when attempting limit pullovers. Take a light weight in each hand and stand with your back against a wall or a post. Start with the dumbells at arms length overhead. Lower them alternately from this position and when the dumbell reaches shoulder level, keep it in this position for a slow count of 2, then return it to above the head and repeat the exercise with other arm. Holding the bells overhead is an important part of this exercise. Start off with 2 sets of 8 reps and work up to 2 sets of 15 before adding weight.